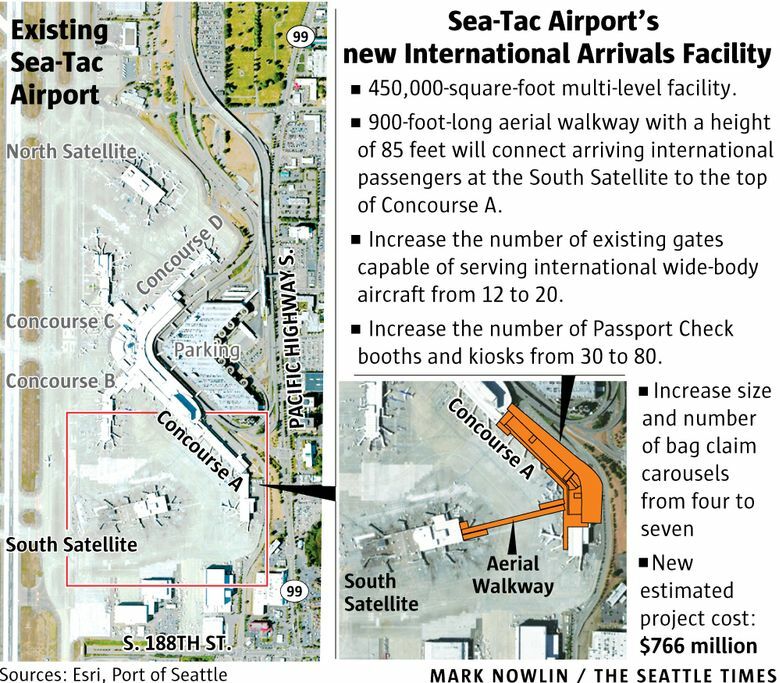 Port of Seattle commissioners will vote Tuesday on a proposed $213 million in additional spending at Sea-Tac Airport: a 16 percent increase in funding for construction of the new International Arrivals Facility and a 19 percent hike in funding for the North Satellite expansion. The Port of Seattle will break ground Tuesday on the new International Arrivals Facility at Seattle-Tacoma International Airport, due to open in 2019. Earlier the same morning, the port commissioners will vote on a proposal to increase the project budget by $105.6 million to $766 million. At that same meeting, the commissioners will also vote on a separate proposal to boost the funding for construction of the North Satellite expansion by $107.5 million to $658 million. The budget hikes, totaling 17.5 percent, flow from more realistic estimates of the cost as the two construction projects move from concept to reality. The money will come from fees set by the federal government and routinely collected on every airline-ticket sale. The new infrastructure is needed to accommodate the rapid traffic growth at the airport. In 2016, Sea-Tac Airport passenger traffic grew 8 percent and hit a record level for the sixth year in a row. The airport served 45.7 million passengers, including 4.9 million international passengers. The North Satellite project is a collaborative effort of the Port and Alaska Airlines to modernize the existing 45-year-old North Satellite terminal and increase the number of gates from 12 to 20. The new International Arrivals Facility (IAF) — a 450,000-square-foot add-on that wraps around the current Concourse A in the main terminal building — will double peak international arrival capacity to 2,600 passengers per hour, according to the Port. Arriving international passengers will walk a new 900-foot-long aerial walkway, 85 feet above the existing airplane taxiway, from the south satellite over the top of Concourse A to the IAF. Delta Air Lines Chief Executive Ed Bastian and Hainan Airlines President Sun Jianfeng are among the guests scheduled to attend the groundbreaking Tuesday. The IAF was originally estimated in 2013 to cost $344 million. A presentation prepared for the Port meeting Tuesday lists reasons for the latest increase in the budget, starting with $30 million extra due to an “understated initial estimate” by the contractors — architects Skidmore, Owings & Merrill teamed with Clark Construction Group — as the project moved from concept to firmer design. Port spokesman Perry Cooper said this amount included higher costs for electrical and communications systems and for concrete and earthworks. An additional $42 million is added to the budget to cover “evolution” of the design required to meet code requirements plus additional scope requested by the airlines or the Port, including a smoke-control system and additional fire protection, Cooper said. Washington state’s sales-tax increase plus extra provisions for security screening and future potential regulatory requirements added $15 million to the budget, the Port presentation notes. “Market conditions” during Seattle’s building boom, producing lack of subcontractor availability and shortages of qualified labor, is another item listed as adding $14 million to the cost. Finally, the complexity of scheduling the work while the airport continues to operate at full capacity added $5 million to the IAF budget. Two separate projects to be done concurrently at the South Satellite with the IAF construction will bring the total all-in cost to $790 million. The reasons listed for the budget increase on the North Satellite expansion project are very similar to those listed for the IAF increases.